The Electoral Officers for the Metlakatla Election Code referendum will be available this evening from 4-8 p.m. in the Harbour Room at the Inn on the Harbour to answer any questions ahead of tomorrow's vote. Polls open on Friday at the Band Office in Metlakatla and the Coastal Training Centre in Prince Rupert and will remain open from 9 a.m. to 5 p.m.
Members are encouraged to attend two upcoming meetings in the traditional territory. The Membersip Department is hosting a full day session on the Government of Canada's Collaborative Process on membership in Metlakatla on February 25 and in Prince Rupert on February 26. Click here for more information. The Metlakatla Lands Department invites Metlakatla members to participate in one of four upcoming community meetings in Metlakatla, Prince Rupert, Prince George and Vancouver. For full details, please see the attached poster. See the attached posting for information about new housing options in the community of Metlakatla. We are looking for volunteer Metlakatla members experienced in the Post Secondary Education System to participate on Metlakatla’s Education Committee. The deadline for the posting is April 13. Please contact Jeanne Leighton at jleighton@metlakatla.ca or 250-628-3234 for more information or to put your name forward. The Metlakatla Lands Department is looking for two members with an open skiff to assist with a two-day shoreline clean-up project around Metlakatla Village. Members must be able and willing to haul shoreline debris from the beach and low water inter-tidal zone onto their skiff for transport to a central refuse bin. Dates and times of the clean-up will depend on tides but it is expected to occur in April or May. The Metlakatla Lands Department wll be hosting two community open houses next week - on December 5 in Metlakatla and on December 6 in Prince Rupert - to gather information and feedback from members about the Metlakatla Reserve Land Use Plan. See the attached poster for more information. 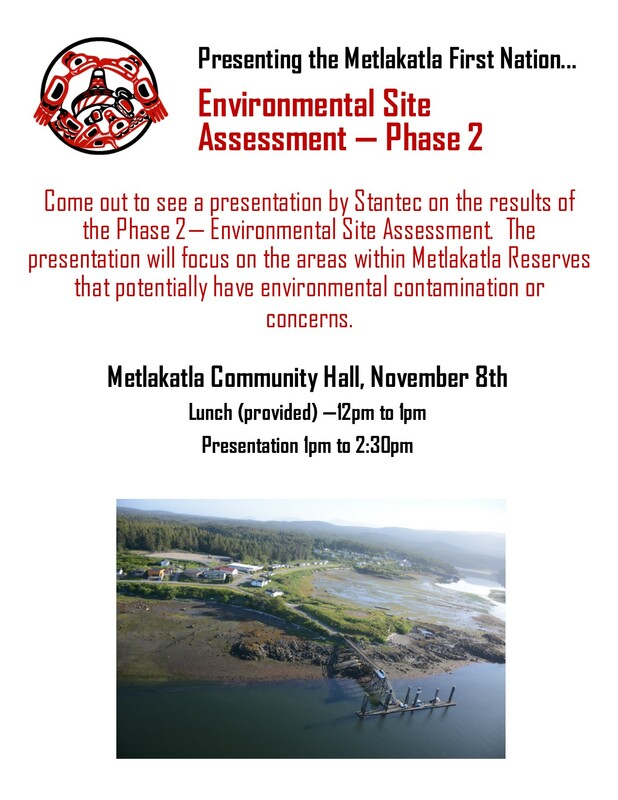 Please take note of an upcoming community meeting on Wednesday, November 8 at the Metlakatla Community Hall to discuss Phase II of the Environmental Site Assessment of Metlakatla Reserves. Click here for more information. The Metlakatla Governing Council is seeking five members to sit on the Lands Management Advisory Committee, a group which works cooperatively to advise on the implementation of the Metlakatla Land Code. Please see the attached posting for more information.